If you live in the UK you'll be very aware that so far apart from that couple of blink and you'll miss it sunny days we had a few weeks ago, we've not had much of a summer, in fact it's been absolutely dire! But whilst watching the weather report on breakfast television a few days ago, I was excited to hear that we are (hopefully) in for some nice summery weather during August. Summery weather often means one thing, I start wearing sandals and flip flops and in order to wear sandals I like my feet to be looking "sandal appropriate" today I'm going to share with you how I prepare my feet so they're looking their best in my sandals or flip flops after all there is nothing worse than having dodgy feet on display is there? 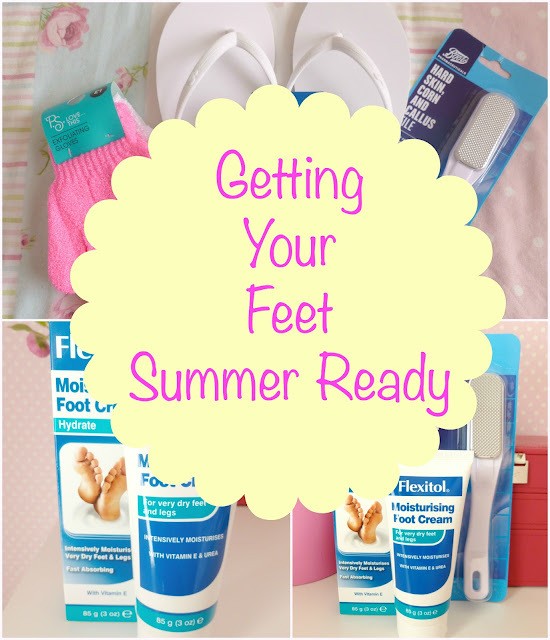 Preparation is key when it comes to summer ready feet, in the UK nice summery weather often comes from nowhere, lasts a couple of days and then leaves us again so personally I think it's best to be prepared, can you tell I was once in the Brownies? First of all I like to keep my feet exfoliated and I find exfoliating gloves a good way to keep on top of exfoliating my feet, the gloves in the above photograph are from Primark and brilliant for exfoliating there's 2 pairs in a pack for just £1.00 which is the most affordable I've found so far and they do a great job, you use them in the shower or bath and use your regular shower gel or you can use a body scrub if you'd rather and exfoliate your feet, this is also a great way to exfoliate your body too. If you use the gloves every time you shower or bath or even 3 times a week it will keep your feet (and body) summer soft. 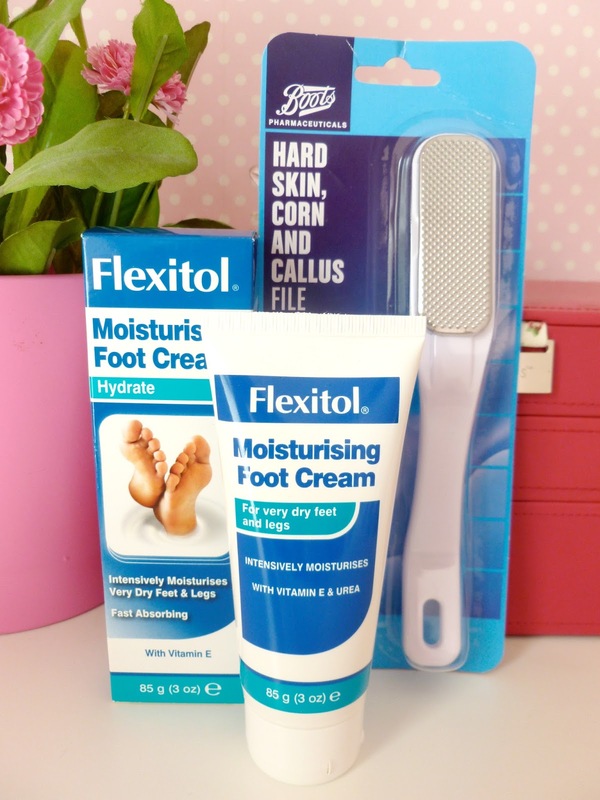 Another thing I think is a great way of keeping your feet super soft and summer ready is to use a foot file, I like the one from Boots, the best time to use a foot file like the one in the photograph above is when your feet are dry so before you shower or bath, use it on any areas of hard skin you may have, if you have a lot use it daily and once it's under control use it once or twice a week, they really are good and you'll soon see a difference, they are really easy to keep clean too running them under the tap and a clean with some anti bacterial soap does the job brilliantly. The next thing I do to ensure my feet are super soft and looking summer ready is to moisturise, I love the brand Flexitol they are brilliant for foot care but also have some great products for the body, hands and nails. 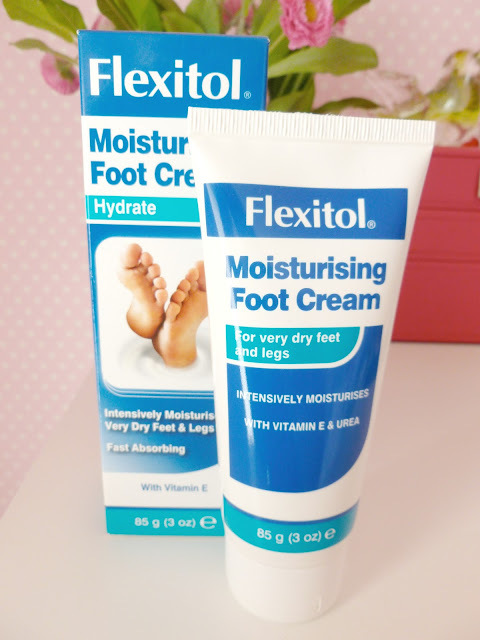 One of my favourite moisturisers to use for my feet is the Flexitol Moisturising Foot Cream available here, it feels very luxurious when applied and sinks into the skin nicely, I like to apply a nice thick layer at bedtime and then sleep in a pair of socks, in the morning my feet are super soft and looking lovely, you can also use the Flexitol cream as a moisturiser for your legs but this is something I am yet to try. 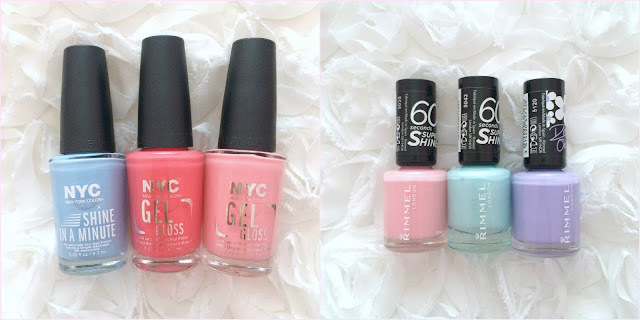 The last step is to paint my toe nails, at the moment I'm loving pastels and the polishes above are some of my favourite polishes to use right now, all look equally amazing on the toes and fingers. So that's how I like to keep my feet looking nice for the summer months, it's something I keep on top of all year round and then when we do get a sudden and often unannounced spell of sandal appropriate weather here in the UK, my feet are ready for me to don my sandals without any worries. I do also like to book in at my local beauty salon for a pedicure a couple of times a year as this helps my feet to stay in perfect sandal wearing condition it isn't a necessary step, just a nice treat that helps along the way. Do you have any tips to keep your feet summer ready? Let me know in the comments and I'll reply as always asap.